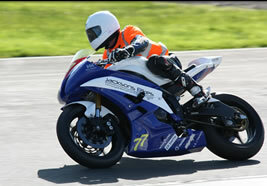 Jackson’s Bikes Racing currently competes in the Scottish SuperStock 600 and British ThunderSport Championships. 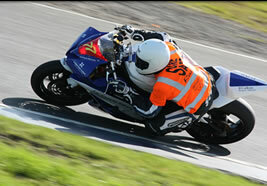 Taking his passion for motorcycles to the race track, Stuart Jackson, director of Jackson’s Bikes, currently competes in the Scottish SuperStock 600 Championship. In his first season, despite suffering a series of crashes, Stuart has quickly proven himself capable of competing among many of the more experienced riders in his class. Commenting on his relative ‘success’, Stuart says “It’s partly the adrenalin, but probably more the pure enjoyment of competing with friends that makes me want to go faster - especially since we are always having a laugh and a joke at each other’s expense. This for me is what motorcycle racing is all about”. Shug as he’s known to his friends competed in the 600 supersport class last year and this year joined 600 superstock onboard his Honda CBR600RR, an accomplished rider, often close to the front enjoy’s the challenge of a good fight and also the laugh in the paddock (normaly at Stuarts expence). Shug was hoping to finish the year in the top ten but having a crash that has left him with ligament damage to his arm has had to call it a day for the remainder of the year and look forward to 2011 and a new years challenges. In his third year of racing now and following his win of the New Era champinship in 2009 has moved on to the Thundersport GB for 2010. In this series he is riding his 4 year old Yamaha R6 against a much harder opposition riding this years bikes. Although well down on power he still holds his own. He has broken a couple of lap records this year and consistantly runs a pace that would see him do well in the 600 superstock in the BSB. 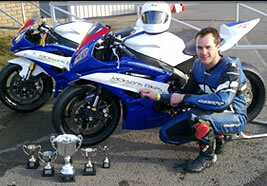 For 2011 Mark is looking to ride in either the British Superstock or Triumph 675 cup running alongside the BSB. Thus to further his development and hopefully push him towards a full time career in motorcycle racing.